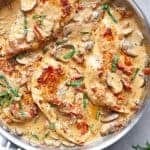 A Creamy Sun Dried Tomato Parmesan Chicken with Mushrooms that is Gluten Free and made with NO HEAVY CREAM.....or ANY cream.....at ALL! In a shallow bowl, combine the flour, parmesan cheese, salt and pepper. Dredge in the flour mixture; shake off excess and set aside. Heat 1 tablespoon of the reserved oil in a large skillet over medium-high heat until hot. Fry the chicken until golden on each side, cooked through and no longer pink (about 5-6 minutes each side, depending on the thickness of your chicken). Transfer onto a warm plate. Add the remaining 1 tablespoon of oil to the skillet; sauté the garlic until fragrant (about 1 minute). Add the sun dried tomatoes and mushrooms; fry until the mushrooms are just soft. Add in the parmesan cheese; allow sauce to simmer for a further minute until cheese melts through the sauce. Add the chicken back into the pan; sprinkle with the fresh basil and a little extra pepper (optional), and serve over pasta, rice or steamed veg. *Substitute milk with almond, rice, oat, or coconut milk. Alternatively, use half and half or a reduced fat cream. If using cream in place of milk, do not add the cornstarch mixture. You won't need it.